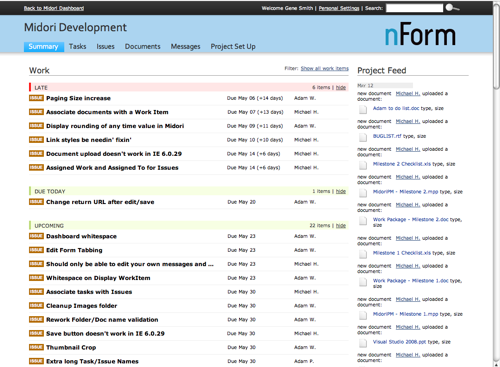 My good friends Gene, Jess and team at nForm have finally demonstrated their awesome new project management applicaiton Midori. Midori is built on top of Sharepoint. And uses a completely custom layout engine. Part of Midori is an engine that gives us complete control over SharePoint’s interface and interactions. We’re still refining the interface, but we’re able to make Midori look and work like just about any other web app (including standards-compliant mark-up and a bunch of ajax-y interactions). While we haven’t made it completely cross-browser compatible, I use it regularly from my Mac without trouble. I don’t use my Mac for accessing many of the internal Microsoft SharePoint sites, mostly because the experience on Firefox 3 is unspectacular. But having built a truly cross-platform layout engine for SharePoint is a powerful tool. I wonder if they would consider licensing it to third-party SharePoint developers.That’s a different question. With companies like Atlassian shipping the SharePoint Connector for Confluence and NewsGator releasing Social Sites and SharePoint and SocialText’s SocialPoint (comments from Don Dodge), there is an ecosystem of products forming to help fill the gaps in SharePoint. It’s a product that is easy for IT departments to acquire, install and deploy. There are challenges (opportunities man, opportunities) for companies in deployment with the user experience and configuration options. But I could see companies like nForm, ThoughtFarmer and others building functional, usable, pleasurable user experiences on-top as a solution for the grow market space. Don summaries some of Ross Mayfield’s , CEO of SocialText, interesting points about building on the Microsoft platform. The "humanizing" of Microsoft has changed his mind about working with Microsoft. He cites Ray Ozzie, Robert Scoble, Channel9 and blogs from Microsoft employees as examples. SharePoint 2007 is a market leader, validates the category, and grows the market for everyone. The short term value (role) for a wiki that supports SharePoint is immediately apparent. SocialText has a profit motive, balanced by freedom, that will sell more seats of SocialText and SharePoint. Everyone wins. SocialText customers told him this was a good idea. You can’t lose when you listen to your customers. I’ve spent the past year trying to balance my desire to build profit driven companies with the freedom of the open idea. But for companies like nForm, partnering with Microsoft is a great way to leverage a successful sales and marketing engine that can help you sell more software.